One of the things that believers often do is muse about what we will look like when we are in heaven. Many times, I have heard someone say something to the effect that they hope they look like they did at an earlier time in their life. 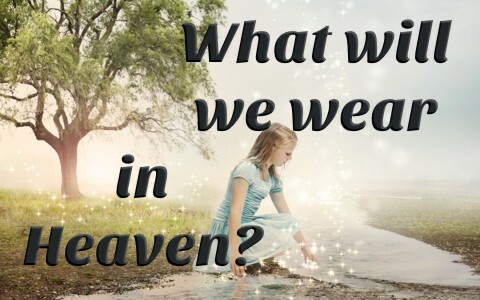 While these conversations are often comical, it does bring up the question of not only what we will look like, but what will people wear in heaven? As always, the Bible has the answers. This is an easy question to answer. The Bible says in 1 Corinthians 13:12 that when that time comes, we will be known as we are known. In the context of 1 Corinthians 13, it is referring to two things. Second, as believers, we will be recognized by our faith. We see in 2 Corinthians 5:1-4 that when our earthly house of this tabernacle is dissolved, we have a “building of God.” In context of 1 Corinthians 4, it is describing our earthly body, which clothes us on earth. When we die then our earthly body is removed and as believers we receive heavenly clothing for our home in heaven. This clothing is described in Revelation 19:7-8, 14 as our righteousness in Christ. Therefore, we will appear as ourselves, but with heavenly righteousness as a coat. As we just learned, we are clothed in righteousness, which is described as fine bright white linen. However, when you look at the clothing in closer detail, we see two things of great importance. First, there are two coverings of clothing that are mentioned in Scripture. There is an outer garment called a cloak and there is an inner coat called raiment. The inner coat is called raiment and it is described in Revelation 3:5 as what we are clothed in by God when we trust Christ as our Savior. It was the same clothing that is our righteousness that we saw in Revelation 19:7-8 and Revelation 19:14. It is also the same as what the seven angels wore in Revelation 15:6. It is important to understand that this raiment is what we wear next to our bodies. It was commonly thought of as our indoor clothing. The outer clothing or garment over the raiment is the cloak. A cloak covers up what is underneath. In popular fiction stories, space that have a cloaking device are hidden from view by the cloaking device. When the device is turned off, then you can see the ship. Likewise, when people wear a cloak, it covers what they are wearing underneath. A cloak is commonly thought of as our outside covering. This is an important concept to understand in that the coat is a tunic that is worn next to the skin. A cloak is a covering that is worn over the tunic or coat. Jesus referred to these two pieces of clothing in Matthew 5:40 when he said that if someone sued you to take your coat or tunic, to also give him your cloak. This is because the cloak was often more expensive and worth more. He was saying to give more than what you were required to give to make things right with others. However, there is another consideration as to the importance of a tunic as opposed to a cloak. If one wears a cloak, it covers what is worn underneath. Therefore, no one really knows what you are wearing underneath if anything at all. Since the tunic or coat was the inner garment, if the outer garment was removed, it would be clear to all what the tunic looks like if someone is wearing one. If the inner garment or coat was the righteousness of the saints given by the Lord, then if one did not have the same coat or tunic, it would reveal an unrighteousness. We see this demonstrated again at the Marriage Supper of the Lamb in Revelation 19:6-10. The bride of Christ, the church is wearing the fine raiment of righteousness. If they were not righteous, then they would be literally naked. We see this connection to nakedness in Revelation 3:18 and Revelation 16:15, which warns people to wait upon the Lord to receive and keep their garments or faith, lest they be found naked! With this in mind, we can fully understand Matthew 22:1-14 when the Lord told of the parable of the marriage of the king’s son. The invitation was extended (Matthew 22:1-7). It was rejected so the king told his servants to find whomever would come so they went out and did just that. In their mission, they returned with people that were good and bad (Matthew 22:8-10). The king then went to see the guests and found a man that did not have on a wedding “garment.” Spiritually speaking, he was not wearing the fine white linen of the saints or a coat as seen in the marriage supper described in Revelation 19. He was literally at the marriage supper and was found to be Spiritually naked (Revelation 3:18 and Revelation 16:15). Therefore, the king commanded that the man be removed and cast into outer darkness where there was weeping and gnashing of teeth (Matthew 22:11-13). The Lord concluded with very important words telling us that many are called, but few are chosen (Matthew 22:14). Believers often muse about what we will look like when we are in heaven. The Bible tells us that there are two coverings, a coat and a cloak. The coat is worn next to the body and the cloak is worn as an outer covering. The coat is described as being the righteousness of the saints. While the cloak is worn, we cannot know if someone is righteous. However, when we die, our earthly clothing and cloak is removed and our heavenly clothing is given to us to wear. If someone is not saved, then they have no covering and they are found to be Spiritually naked. Spiritual nakedness results in casting into outer darkness where there is weeping and gnashing of teeth. how did john the beloved die ? Bro when Peter found Jesus naked than he cover him with his coat and next when Jesus appeared in upper room in white garment. How is it that happened ? Hello Grish. The Bible never says Peter found Jesus naked and then covered Him. WHere did you hear this? This is not true.